For today’s watercolor exploration, I chose three primary colors: magenta, permanent yellow and ultramarine blue. By applying each layer of color after the previous layer was completely dry, I was able to preserve the opacity of the layers. 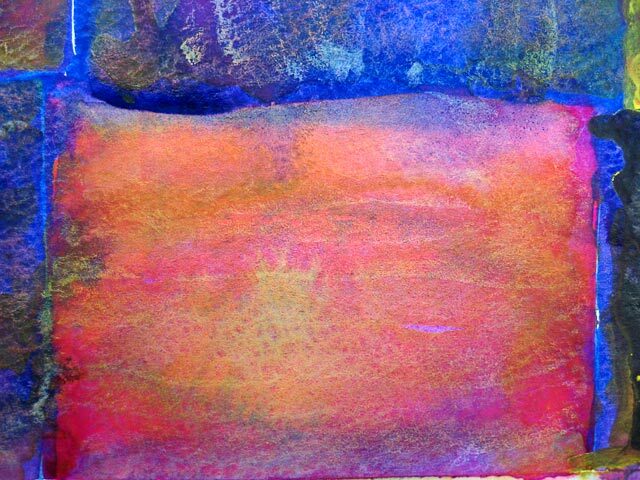 As the colors dried, they pooled in distinct layers on the surface of the paper, and by various means, I could move them around or lift them off the paper entirely, giving a unique textured effect. Besides giving texture, these colors provide an effect for the viewer called optical mixing. 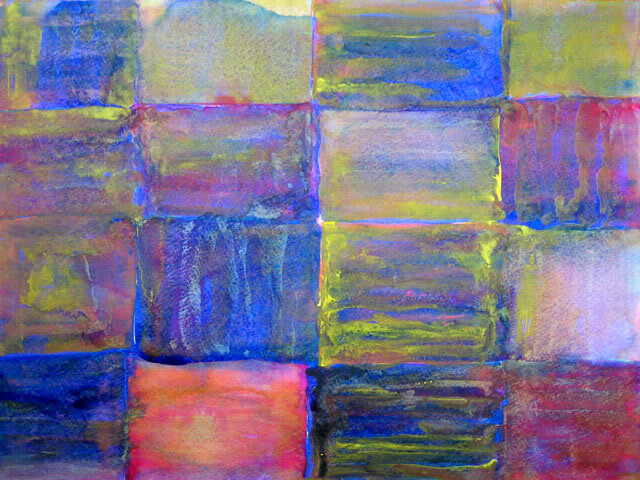 In optical mixing, the viewer’s eye gathers information about adjacent patches of separate colors, say magenta and ultramarine, and the viewer’s brain mixes the colors into a rich purple, which is what the viewer perceives. The lessons here are 1) the waiting is as important as the painting, and 2) what you get isn’t always what you see. I agree with Christine, tasty! Hi! You did a wonderful job of layering and keeping the colors vibrant. I like how the texture adds to the visual delight! Love your color choice, and the one color block at the bottom is so striking in the midst of all the gorgeous colors. Very nice, I am drawn right away to the colors. These are just beautiful and so vibrant. I love them!